Purchased at a thrift store for $20. That would amaze me except that hardly anyone (including me) listens to reel tapes anymore, and collecting these things is like collecting coffee tables: they take up a lot of room if you don't have the space to do it properly, which I definitely do not. Collecting spoons and shot-glasses would be much more sensible. The Museum of Magnetic Recording has a nice write-up on Roberts (as well as other makes), and if you want to know more, definitely look at their website. For our purposes, I'll boil it down to this: Japanese-made Akai reel recorders were sold in the USA under the Roberts name, but as Akai elsewhere in the world. Around 1973 the Roberts disappeared and the Akai name became universal. So every Roberts reel-to-reel recorder has an identical Akai counterpart. This model is also known as the Akai M-9. That's a useful thing to know if you're looking for literature, parts or accessories, since sometimes one can find things listed under one brand-model combination but not the other. This particular model began (as far as I know) in the early 1960s as the 720 (Akai's M-7), a nice tube-based 4-track recorder/player. 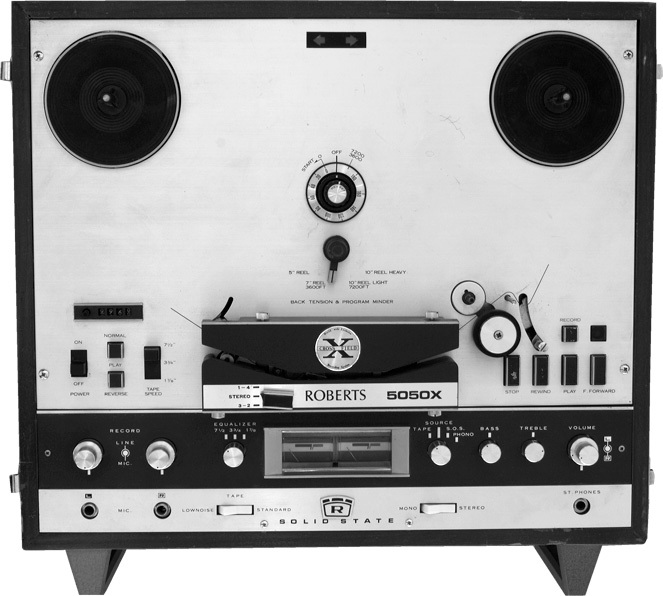 In the mid 1960s, Akai (and thus Roberts) developed the cross-field head recording system (whether it was really great or just a marketing gimmick—I don't know) and sold it as the 770X (Akai's M-8) . They later converted it from tubes to solid-state and called it the 771X (aka Akai's M-9). One is the way it handles tape speed. Cassettes had one fixed speed, but reel machines could use different speeds depending on your needs. The fastest speed was the highest quality, but it used tape up the quickest. Commercial/studio speeds were 15 or 30 inches-per-seconds (IPS). 15 IPS is 1-1/4 feet per second, or 75 feet per minute; so an 1800-foot reel (a standard size) yeilded 24 minutes of recording time per side. That was fine for commercial work but most amateurs wanted something that lasted longer. Consumer-level machines typically had three speeds, 7-½ IPS, 3-¾ IPS, and 1-7/8 IPS (a few offered 15/16ths, for when 1-7/8 just wasn't crappy enough). 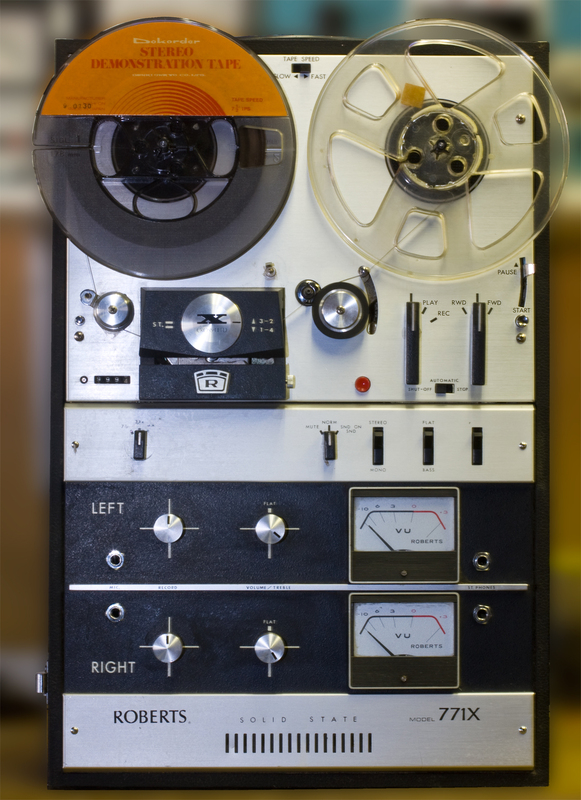 The fastest was for high quality recordings—typically music. The middle speed was for good voice quality, and slowest for where you wanted to record things where sound fidelity wasn't important—things like dictation or a letter to a son in the Army. Slow speeds are also necessary when using small 3-½ inch reels. My older machines, such as my Webcor and Wollensak, both from the 1950s, have two speeds: 7-½ and 3-¾ IPS. My semi-pro machine, the Roberts 5050X, has three speeds. All are selectable by a switch. But this 771X only has two speeds, fast and slow. What is fast and slow? It depends on the capstan. That's a little shaft that spins and rides against the rubber tension wheel. The speed that the capstan rotates determines the speed of the tape. Normally, on this machine, "slow" is 1-7/8 IPS and "fast" is 3-¾. But you could slip an accessory roller on top of it which doubled the diameter of the capstan, and that doubled the speed. With the accessory in place, "slow" was 3-¾ and "fast" was 7-½ IPS. Do you think I have that roller accessory? Of course not. It's long gone. They provided a place to keep it but it's not there. If I want one, I will either have to turn one myself or buy one from a machinist on the internet who is selling them for $45 a pop. In the meantime, that means that my 771X's top speed is 3-¾ IPS. That's fine for most pre-recorded tapes and some of my home-records, but won't play my high-quality pre-records (like my Dokorder stereo demonstration tape) or my better home-recordings. Another feature that I miss is dual-direction playback. My ancient Webcors can play or record in either direction without flipping the tape over. So can my Roberts 5050X. My Wollensaks and this 771X cannot. Sound like a minor thing? If you're hunting for something in the middle of a tape and you don't know which side it is, then yes, being able to switch directions on the fly is a damn nice thing. The final item that made me want to tear my hair out is the output jacks, which take 1/4-inch phone plugs instead of the more common (now) RCA phono plugs. As I have no patch cables with phone plugs but many with RCA plugs, this annoys me greatly. This was sold outside the US as the Akai X-330, which may be useful to know if you're looking for documentation on it. See my comments about Roberts and Akai above. There's also a 5050XD variant of this machine (and an X330D). The difference is that the D versions are "decks," in that they don't have the internal speakers and power amplifiers to drive them; they were meant to be cabled into a stereo amplifier (usually as part of a component system) and run accordingly. They also lack the Bass and Treble controls (lower right hand side on the photo). It's a nice machine; I made a lot of very good recordings with it. It's got the best sound, it's relatively well behaved, and it's the easiest to deal with since it has standard RCA phono jacks, so I can easily hook it up to my component stereo for recording and playback. Can't do that with my older rigs. Like my Webcors, this one has a wood cabinet, but it's bare-wood, not fabric covered to look like luggage. It's not quite as large as the Webcors but feels like it's made of lead. The big difference is that it can handle 10" reels; everything else I have is limited to 7". This one has a few other extra little niceties. There's an idler that's engaged when the tape is threaded, so when you reach the end of the reel and run out of tape, the idler disengages, a switch is opened, and the reel motors shut off so the tape end doesn't go whap whap whap until you turn the machine off. That's particularly nice when you're rewinding. There's also a program minder, which is fussy but it mostly works. It operates along with the rev counter: you set the pointer so that when you nearly reach the end of the tape, the machine will stop, switch directions, and then continue to play or record in the opposite direction. I believe it stops when the minder gets back to zero. It's a neat gimmick if you can get it to work. I can do it but it's not dependable. This is the sort of feature that "digital" electronics does really well and mechanical stuff struggles with. My Webcor reel recorders have been relocated. My Wollensaks have been relocated.